for developing and merchandising this excellent mod! 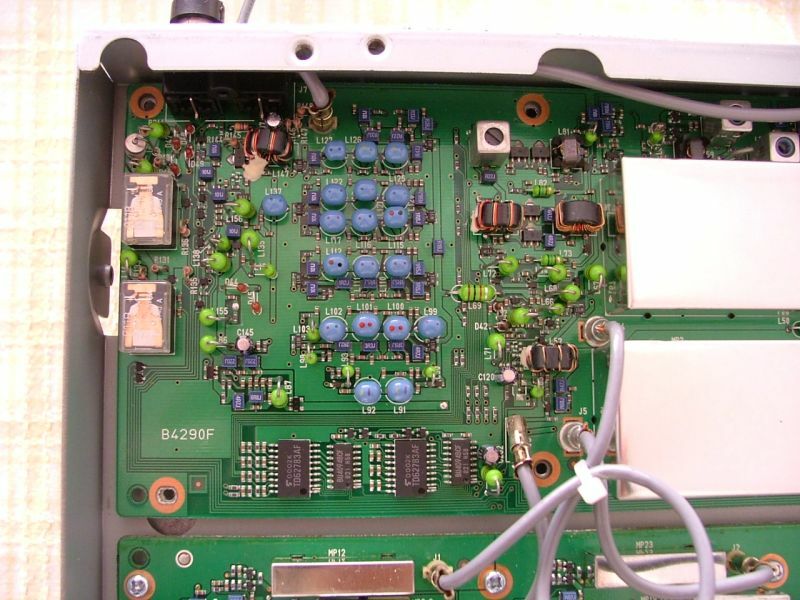 Icom IC-775DSP before installation of the Inrad Roofing Filter. followed by a high dynamic range, feedback amplifier. 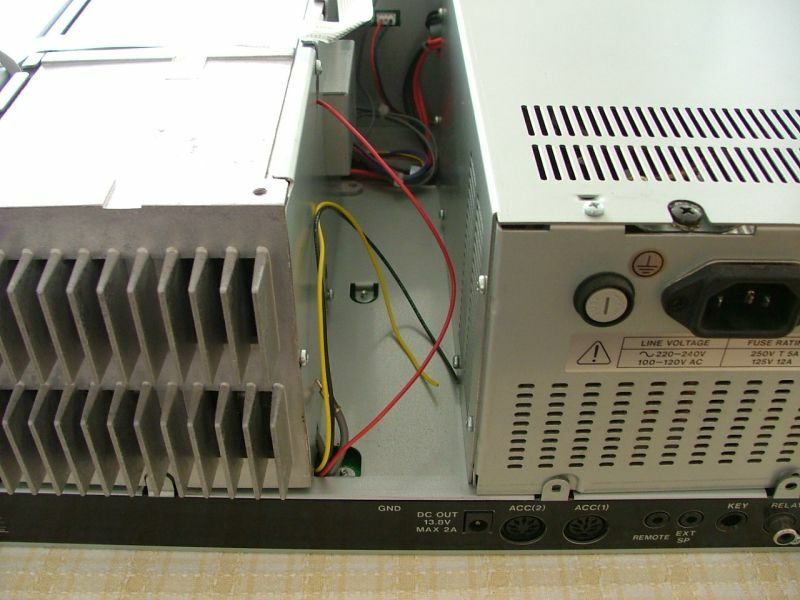 The amplifier provides enough gain to override the filter insertion loss plus a few dB. The upper side of the board of the Inrad Roofing Filter. The under side of the Inrad Roofing Filter. 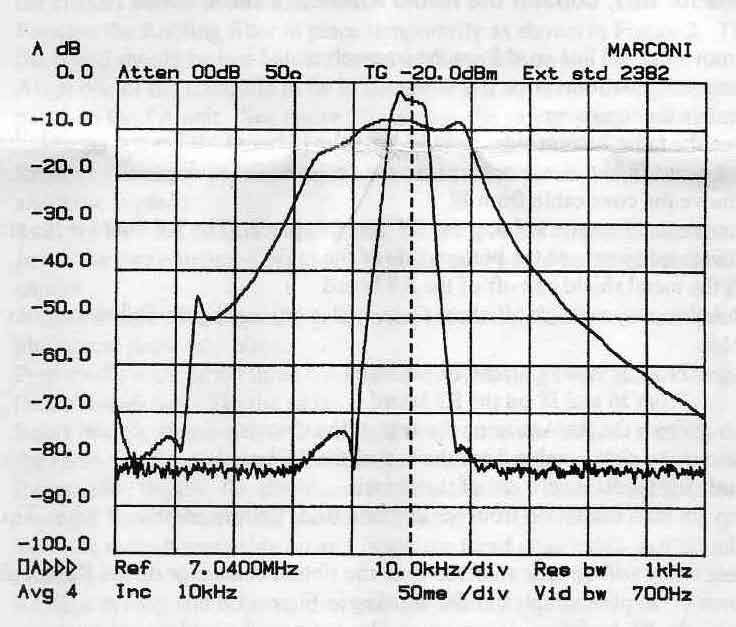 The plot above shows the sweep frequency response of the RF board in an IC-775 radio. and the narrow curve is with the Inrad Roofing Filter Mod added. The improvement in first IF selectivity is dramatic! 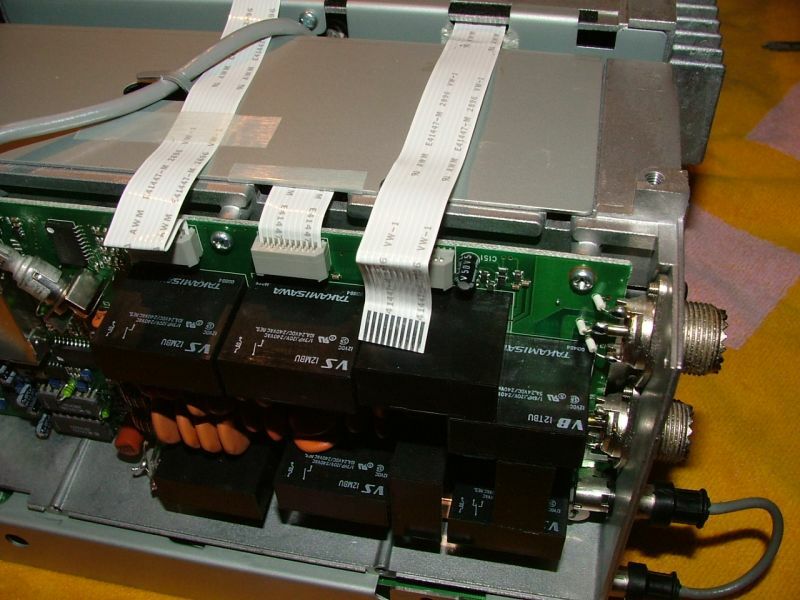 in the SSB-band and less burps and beeps on CW from strong signals. will be determined by the Roofing Filter, which is about 5 kHz. This may degrade the audio bandwidth for AM and FM reception somewhat. These modes will still be available for reception with the sub receiver. 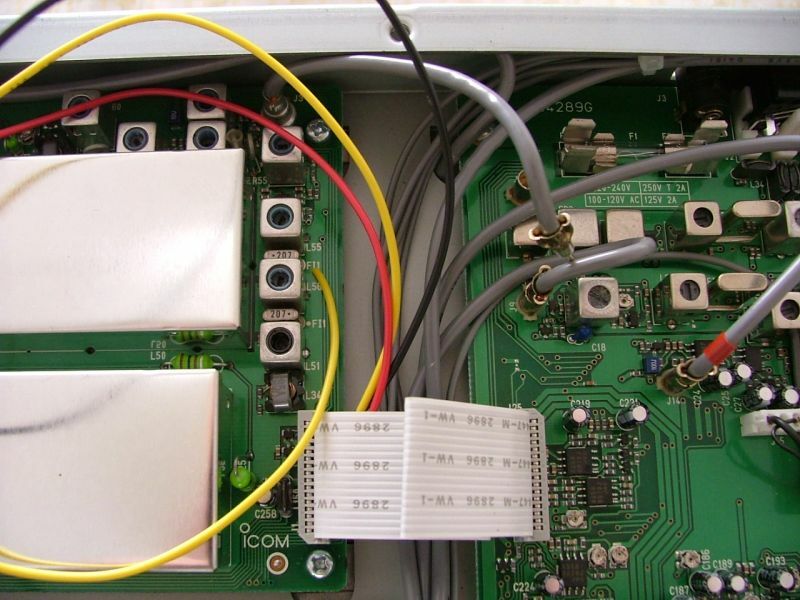 The wires, coax cable and standoffs, supplied from Inrad together with the Roofing Filter Mod. 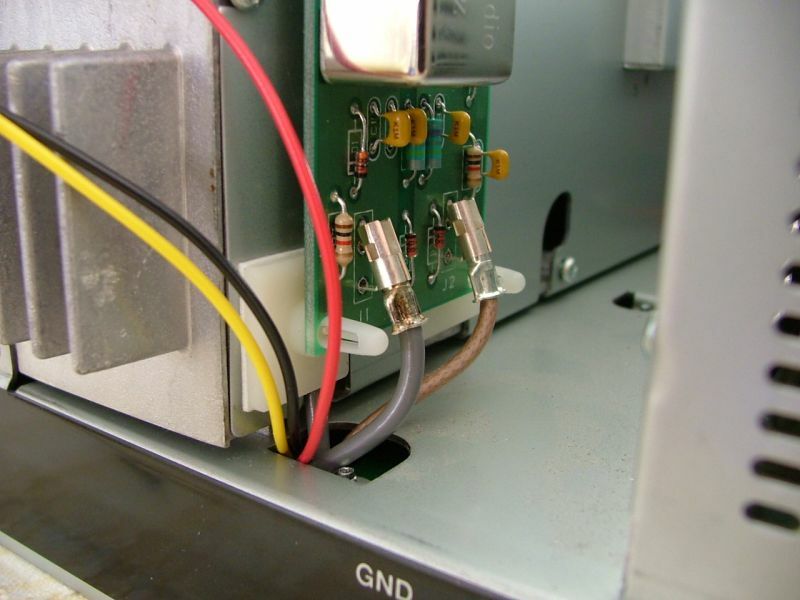 WARNING: modern radios contain components which may be damaged by static discharge. 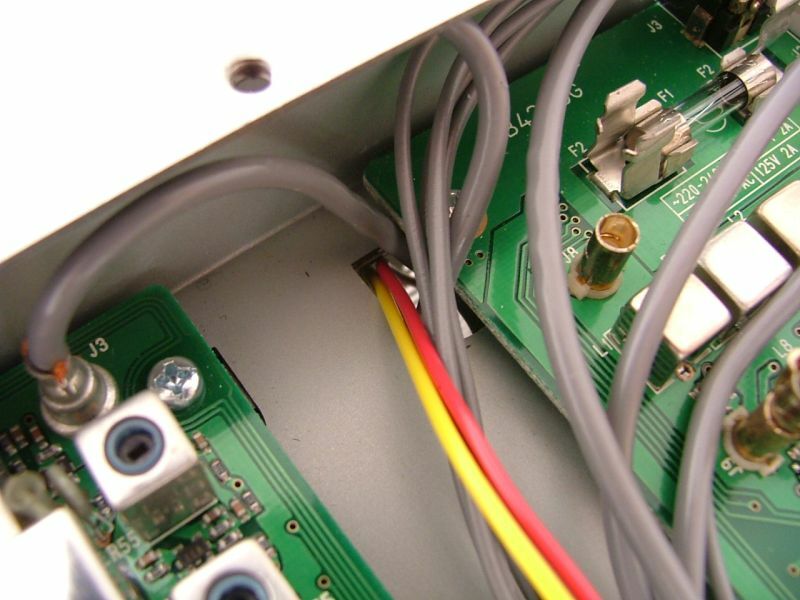 between the operator and the radio before any of the internal circuits are touched. 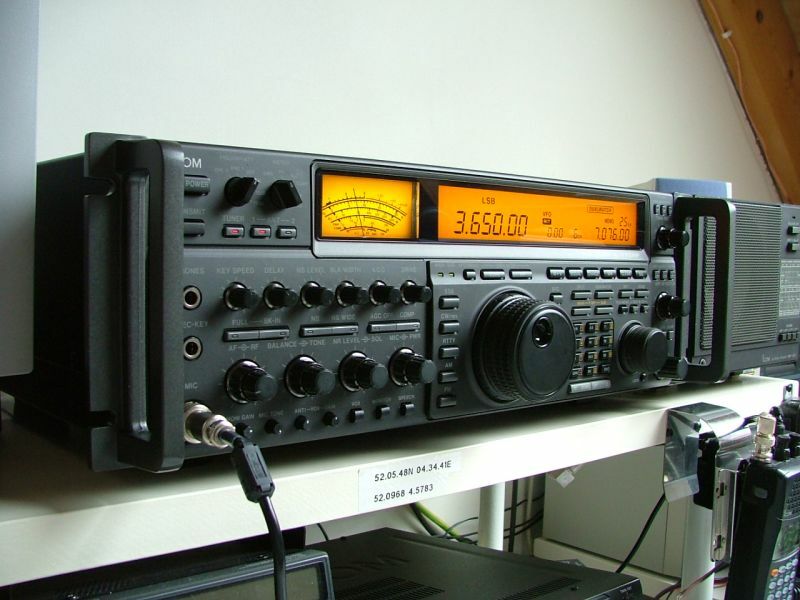 consult the ARRL's Radio Amateurs Handbook. Place the radio bottom side up and locate the IF-board; it has the cyrstal filters on it. Locate J8 in the rear corner near the center of the back panel. 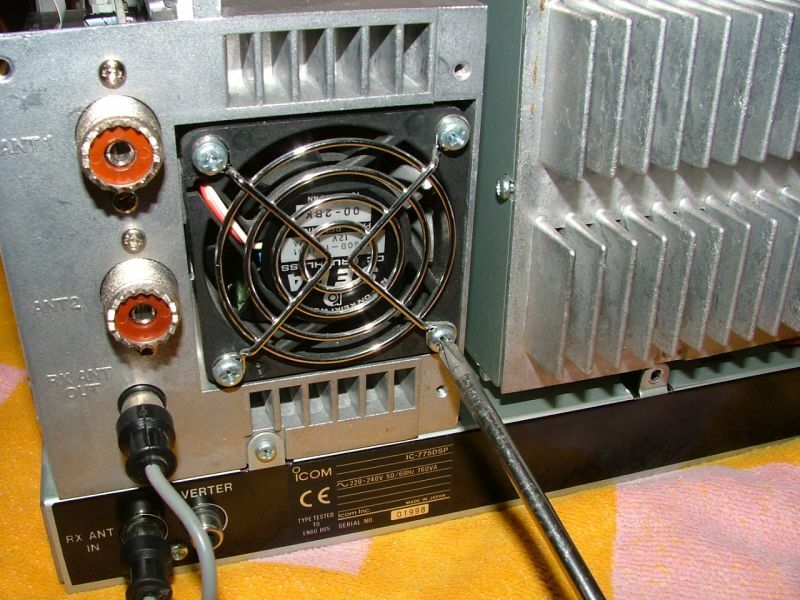 Remove the coax cable from J8. 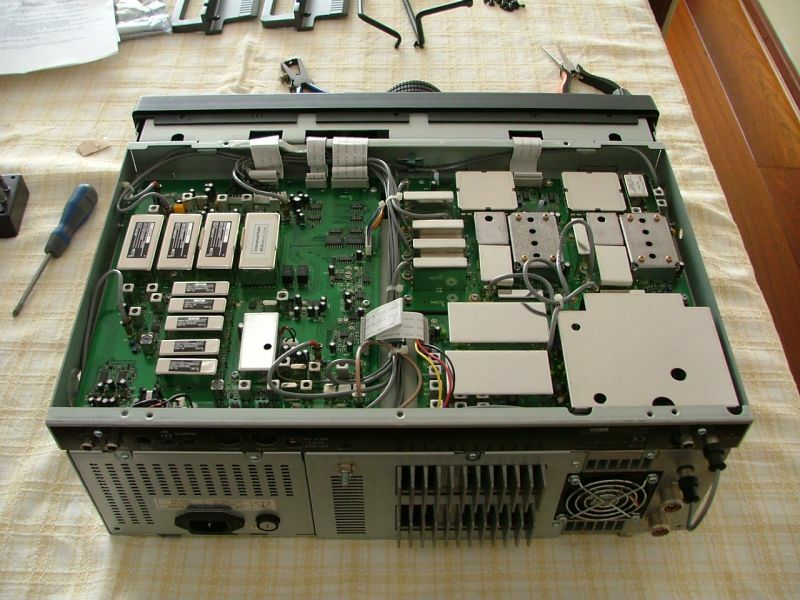 Remove the 6 screws holding the RF-board in place. 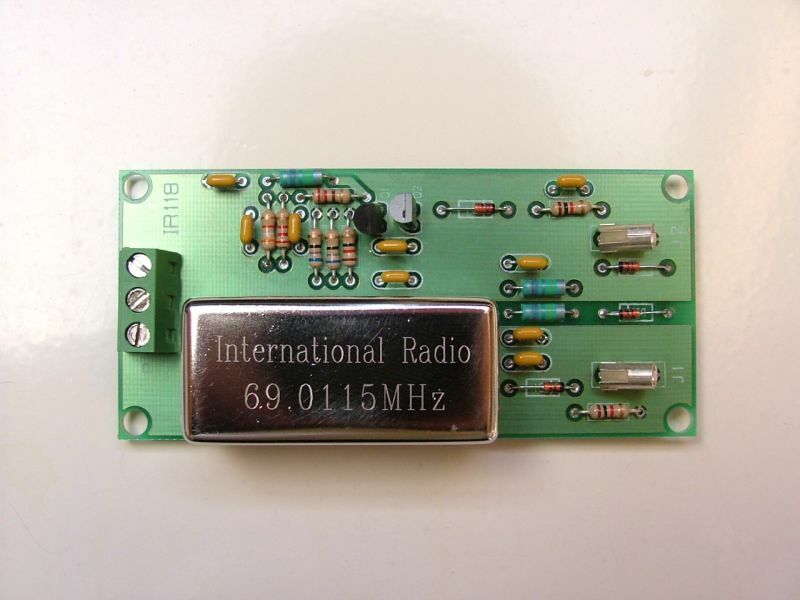 The RF-board is the smallest of the three boards on the bottom side of the radio. 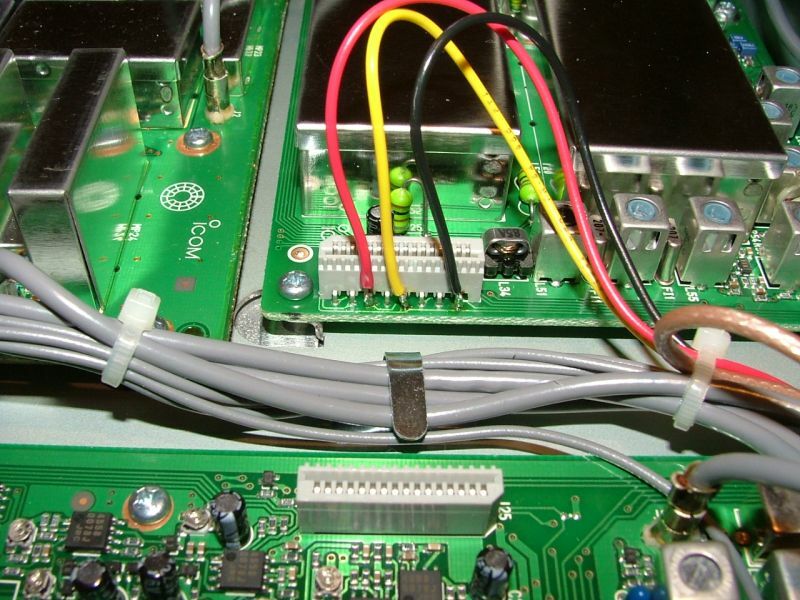 Remove the screw near to the RX ANT IN connector on the rear of the chassis. 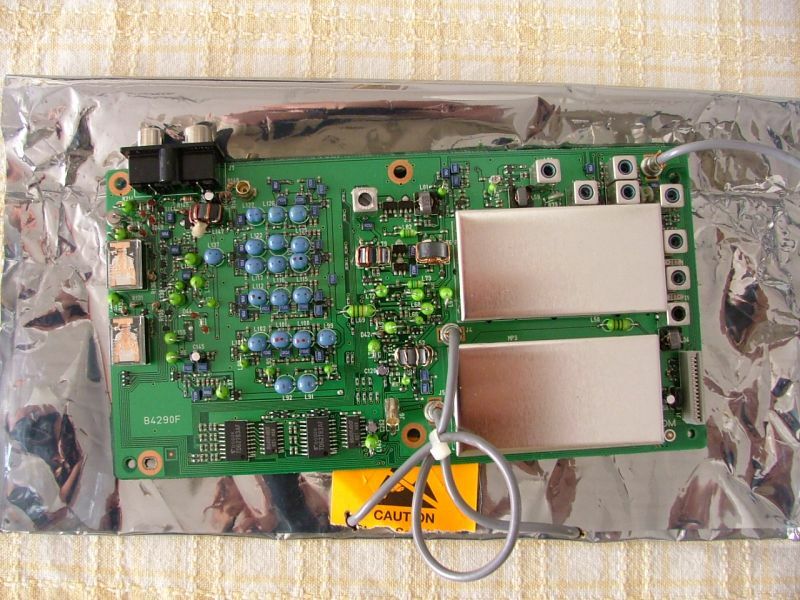 Lift the metal shield can off of the RF-board. - from the RX ANT IN on the rear of the chassis. 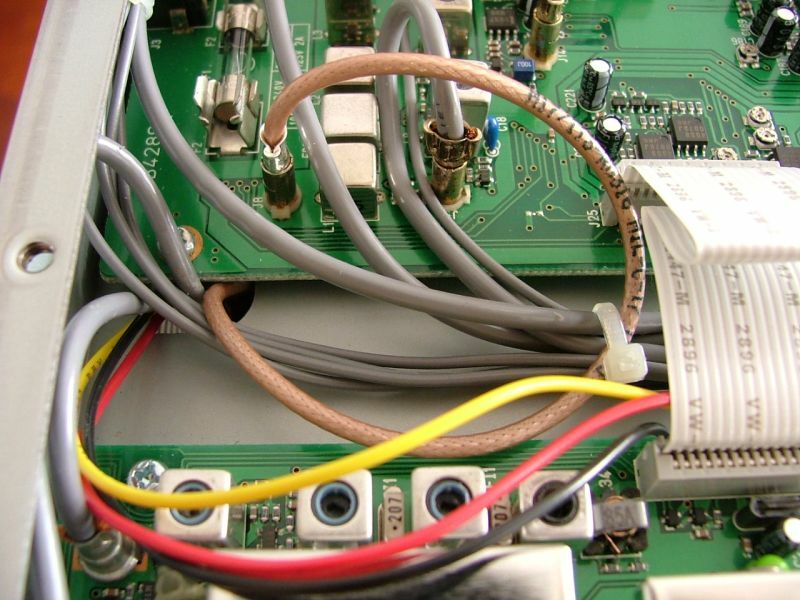 Remove the ribbon cable from the end of the RF-board. And gently lift the RF-board out of the chassis. 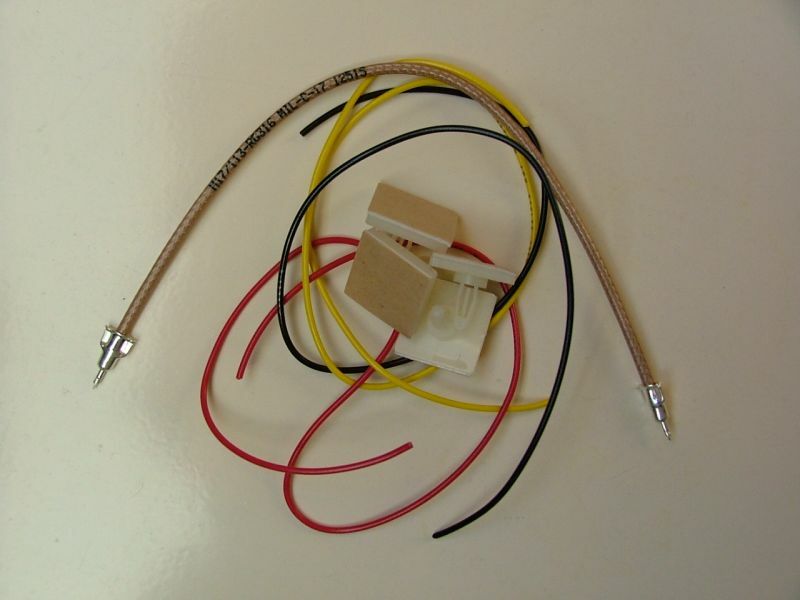 Strip 1/8 inch insulation from the end of the red, yellow and black wire supplied by Inrad. Tin each end of the three wires. as shown on the photograph above. except for the short coax which was in J8 on the IF-board. 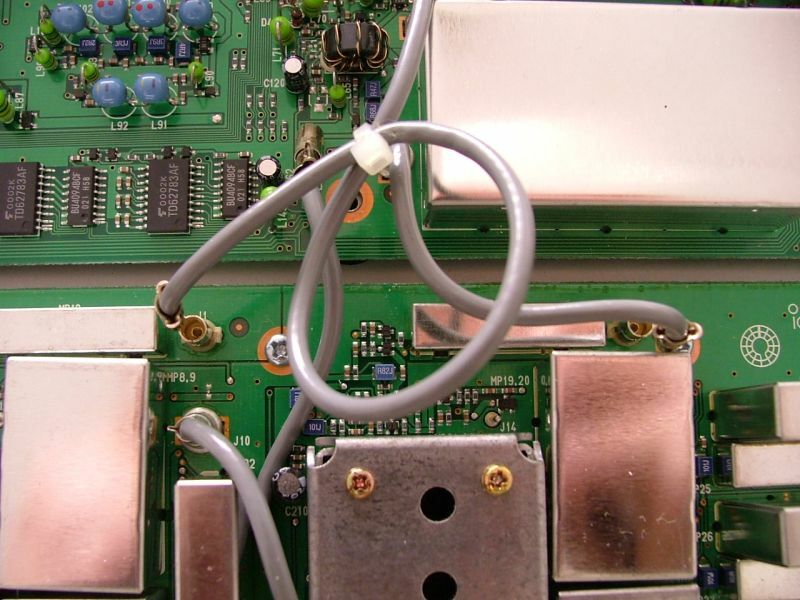 IMHO it is not necessary to remove the RF-board! 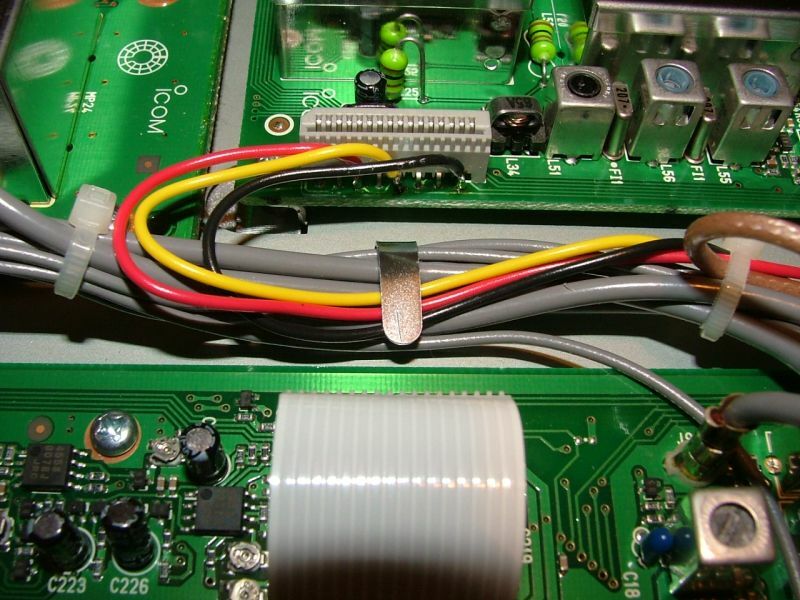 while keeping the RF-board on its place. 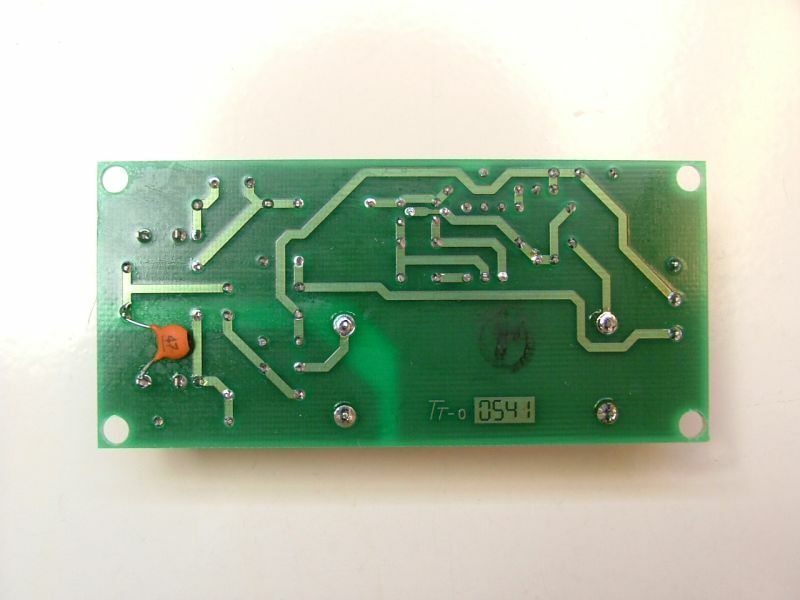 at both sides (from the RF-board and from the IF-board), as shown on the photograph above. Gently bent the three colored wires and tighten them with the cable clip which is mounted on the chassis. Feed the coax that was in J8 through the chassis hole nearby. Also, feed the three colored wires through this hole. Turn the radio top side up with the front panel away from you. 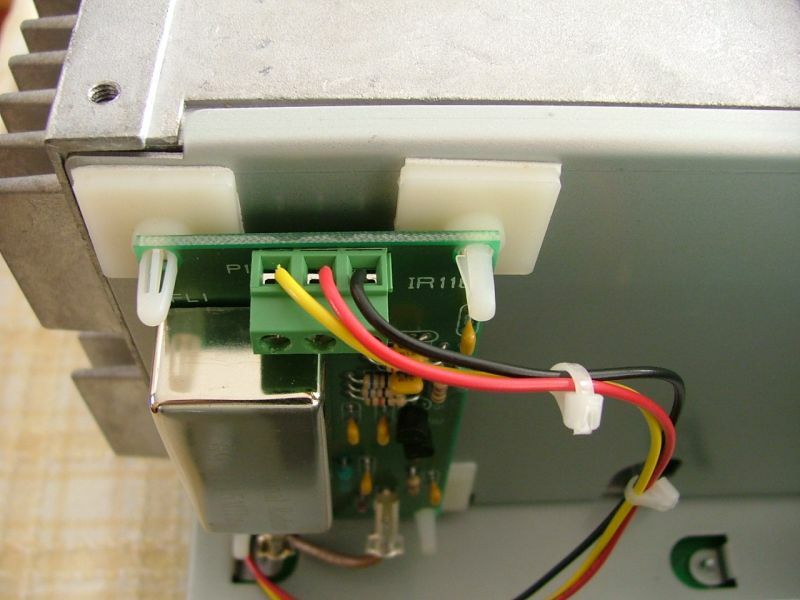 Remove two screws from the loudspeaker and set it aside. The PA-unit has as series of fins sticking out the back. 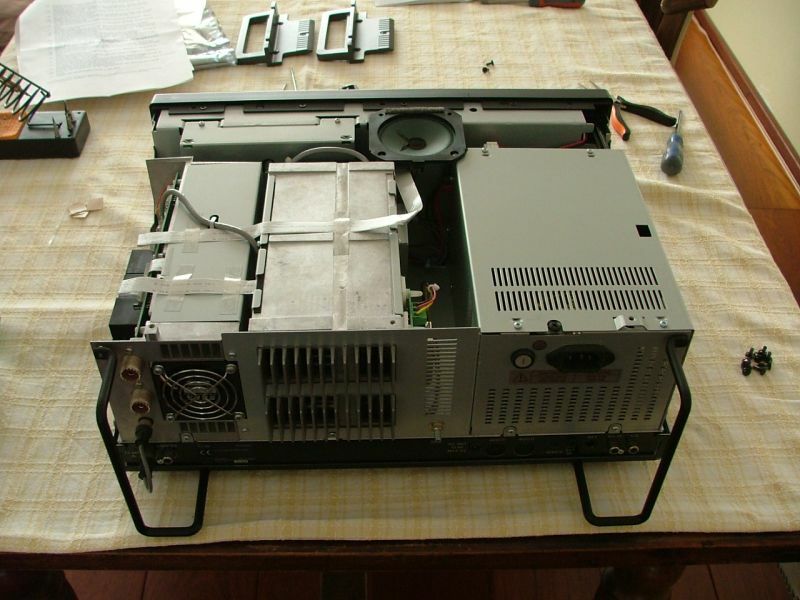 Remove three screws holding it in place; one on the back and two on the front of the PA-unit. Do not move the PA-unit at this time! The Regulator-unit (Reg-unit or Power Supply) is to the right and has the AC receptacle on it. Remove the four screws holding it in place; two are on the back and two are up front. Do not move the Reg-unit at this time! The shield plate has the grounding wing nut on it. 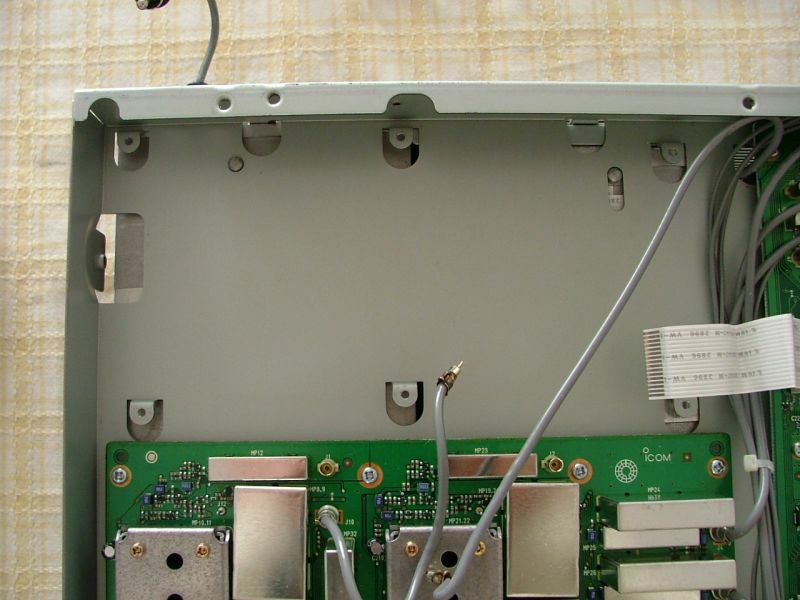 Remove the two screws holding the shield plate in place. Do not try to remove the shield plate at this time! as shown on the photograph below. without realizing it at the time. 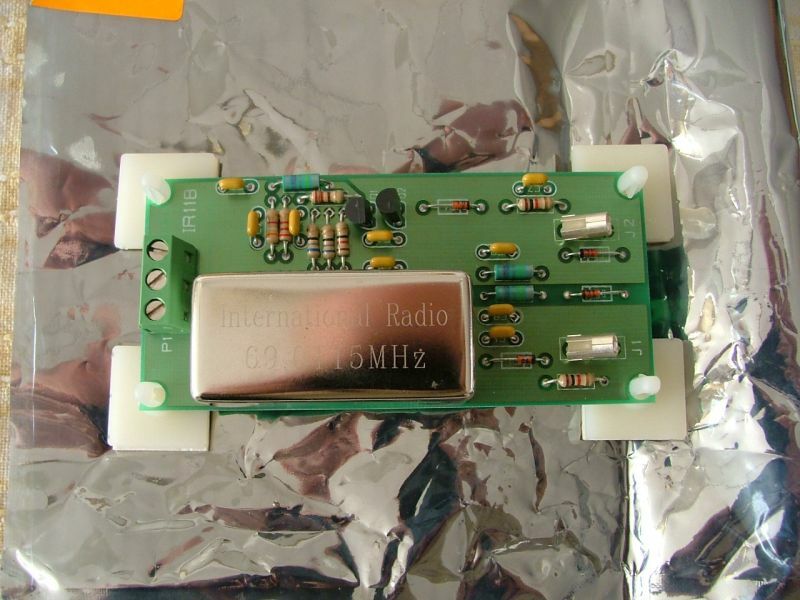 The result is the radio will not transmit. 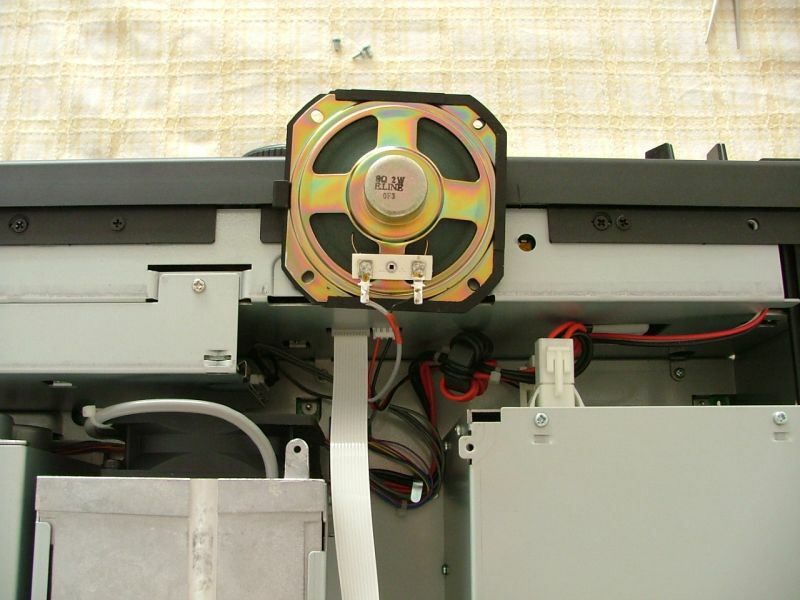 There is no stress relief on the ribbon cable inside of the PA-unit. 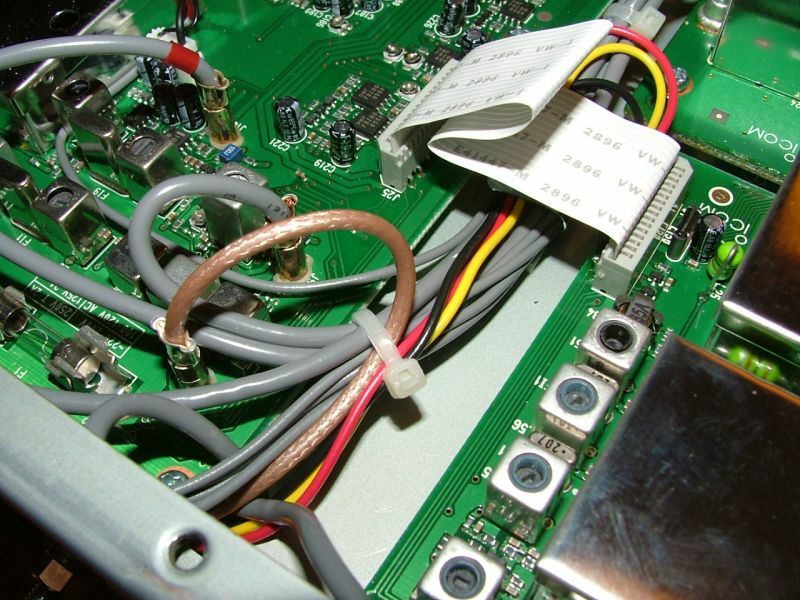 this ribbon cable can become disconnected from it's socket (connector) inside the PA-unit! as shown on the photographs above. when you move the PA-unit a bit. and pull it's rear end away from the center of the radio about 1/8 inch. This will free up one end of the shield plate. Then lift the rear end of the PA-unit high enough (about 3/8 inch) to remove the shield plate. Prepare the Roofing Filter Mod by inserting the four plastic standoffs. Do not remove the safety papers yet! 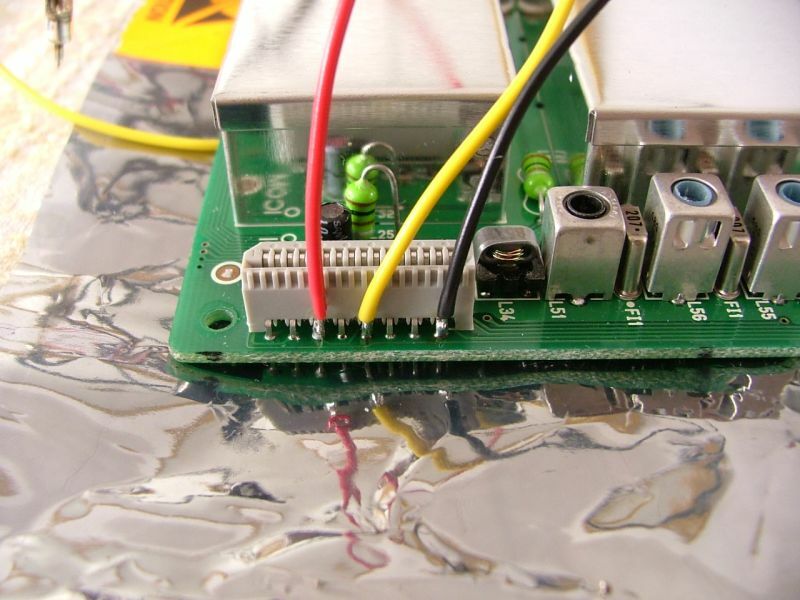 plug the Inrad supplied coax cable into J2 of the Roofing Filter Mod board. as it will become difficult to insert them after the next few steps. and stripping 1/4 inch of insulation. Tin the ends of the three wires. as shown on the photograph below and tighten the screws. I advise you to tighten the three screws before you fix the board on the PA-unit! Feed the Inrad supplied coax cable through the chassis hole to the bottom side. Remove the safety paper of the four standoffs and install the board exactly as shown on the photograph above. Re-assemble the PA-unit, the shield plate and the Reg-unit. 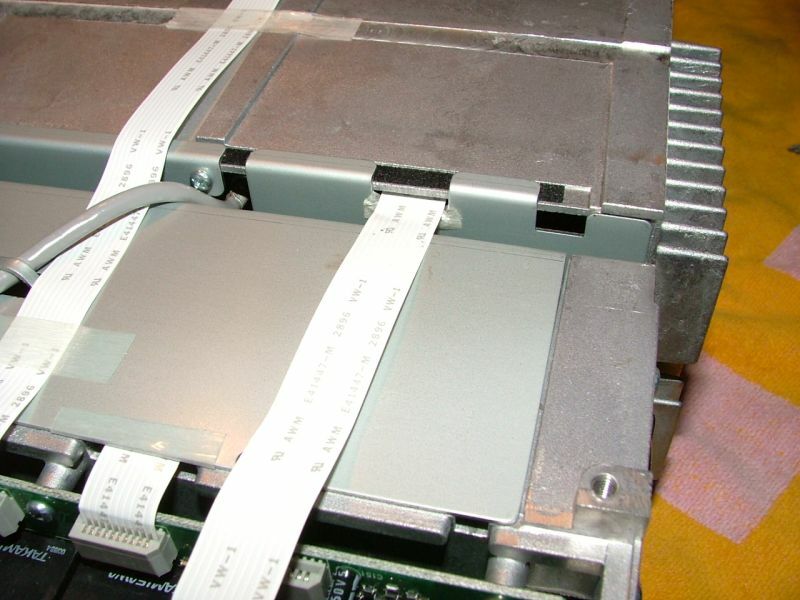 Then reconnect the ribbon cable into the connector of the Ctrl-unit. 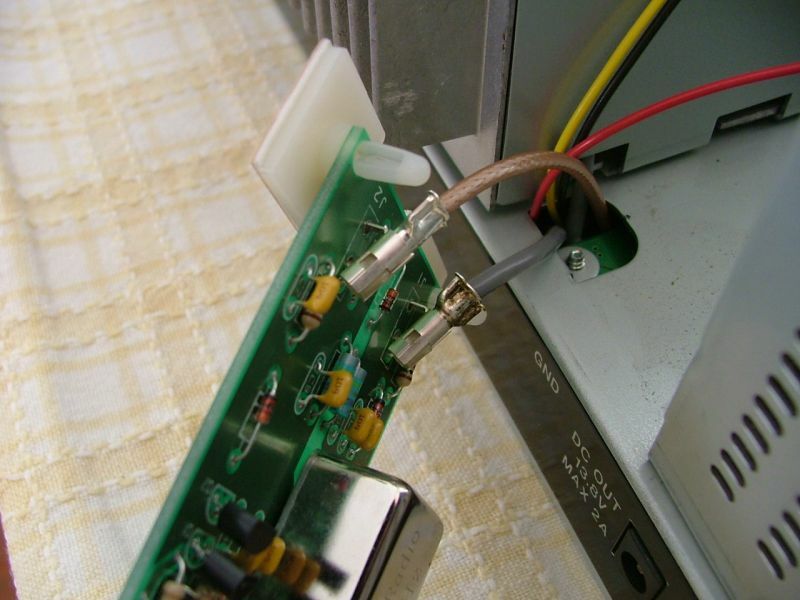 And replace the two pieces of tape, securing the ribbon cable on the top of the PA-unit. Tighten the screw of the fan. Turn the radio bottom side up. 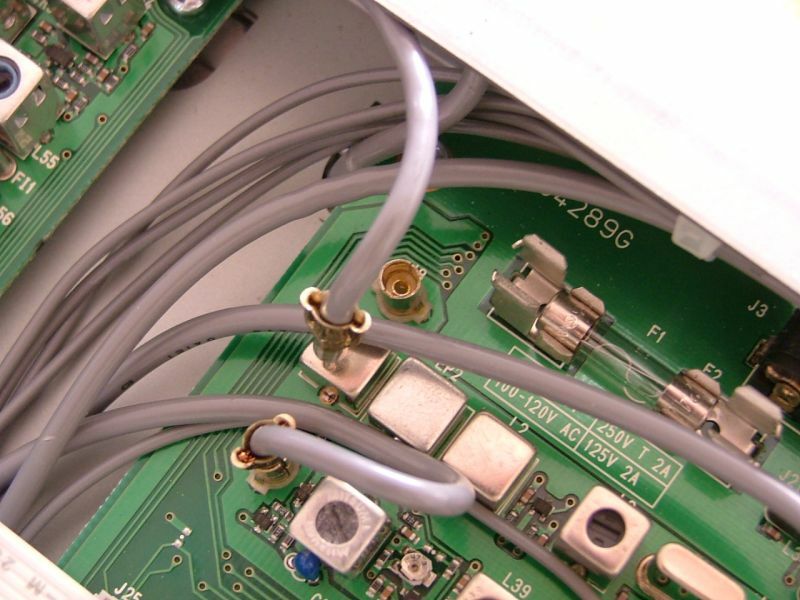 Insert the Inrad coax cable into J8 on the IF-board. Tighten the coax cable and the three colored wires with cable ties. 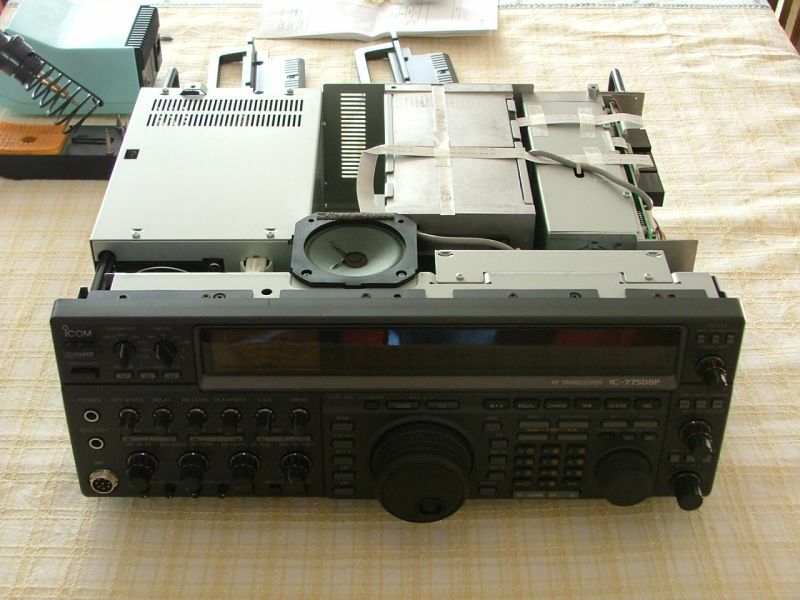 Replace the top and bottom covers of the radio. 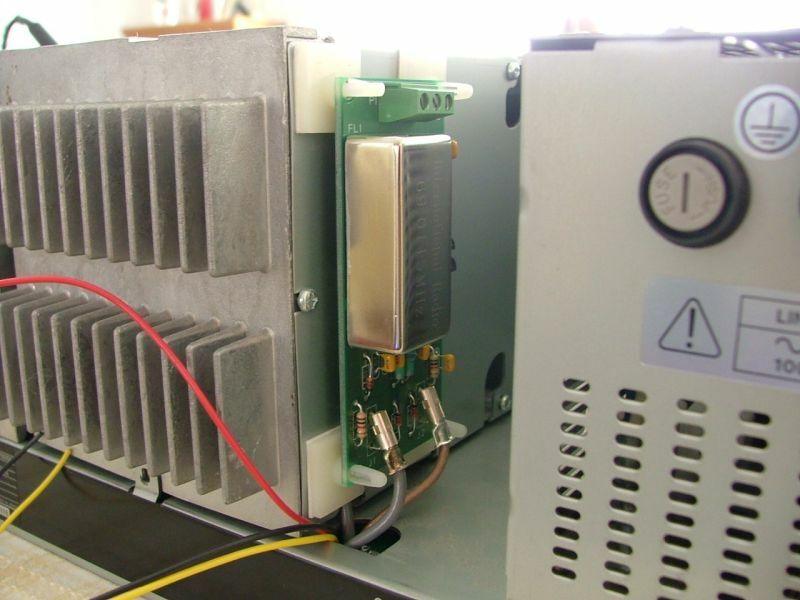 Quite a different Icom IC-775DSP with the Inrad Roofing Filter Mod!